We are pleased to announce the release of GoldMine Premium 2014 with added Mobile Edition support for Android. GoldMine Premium Edition now integrates directly with Constant Contact and is support for Microsoft Office 2013 is available. Gold Business Solutions aquires The Old Post House, Weybridge, Surrey - Serviced Office Space and Virtual Office Solutions. 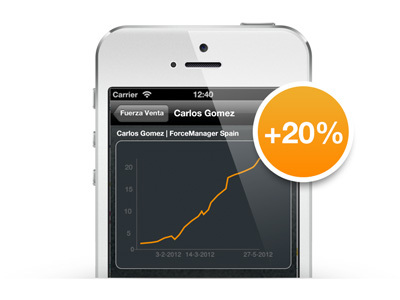 ForceManager boosts the number of impacts between your sales force and your target market by more than 20%. ForceManager maximises sales efficiency by making the sales agent's job more rewarding - and more productive. 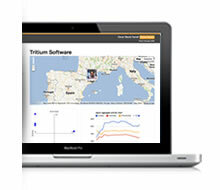 is designed to help your field sales force do their job better. It makes selling easier - no matter where. ForceManager reveals critical information about sales activity, allowing for cost reduction and clearly identifying opportunities for improvement. 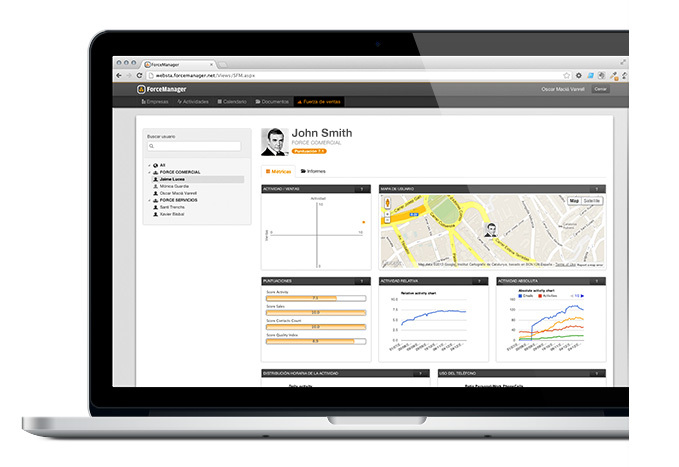 ForceManager stands the typical sales management model on its head. The sales representative no longer reports activity through a software system. Thanks to ForceManager, it's now the software system that reports to the sales agent, sending them an automatic e-mail with a weekly activity report. The report includes the activity score, a quantitative measure of the volume of impacts generated as compared to other sales agents in the same company. This quantitative measure of the sales activity comes along with a qualitative analysis. For example, the coverage analysis indicates how the agent's sales efforts are distributed across different client categories, segments or types, while the activity spread shows how the agent has distributed his effort across accounts. These objective metrics provide the sales representative with insight into their own efficiency, helping them achieve better results by focusing on the most effective actions. Experience shows that ForceManager incentivises the sales agent to be more proactive, increase sales activity and generate up to 20% more impacts. A sales representative should be wholly focused on selling. This may be stating the obvious, but sales agents often spend a large part of their working day on other tasks, such as reporting their activity to managers. Given that sales professionals naturally want to achieve targets, these additional tasks are an obstacle. This is why many Customer Relationship Management (CRM) systems generally have trouble with user adoption. Let's face it: these systems don't actually help to sell more. ForceManager offers a set of native apps for mobile devices with an overriding goal: to increase the sales agent's capacity to convert activity to sales by providing continuous access to essential information. 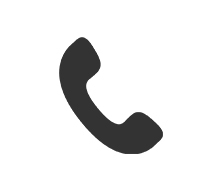 The apps automatically register and display every call, e-mail and appointment. Thanks to the automatic impact register, the sales representative doesn't need to report activity - it's already in the system. 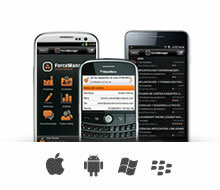 ForceManager guarantees 100% user take-up. But the most important thing is that each and every one of those users will be a motivated sales representative, working in an efficient way and fully dedicated to selling. 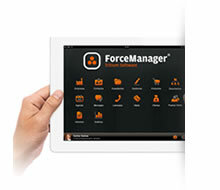 ForceManager is designed to help your field sales force do their job better. It makes selling easier ' no matter where. Mobile devices today are user-friendly, practical and extraordinarily powerful. But to get the best out of tablets and smartphones, you need to do more than migrate software originally designed for the web or a desktop PC. 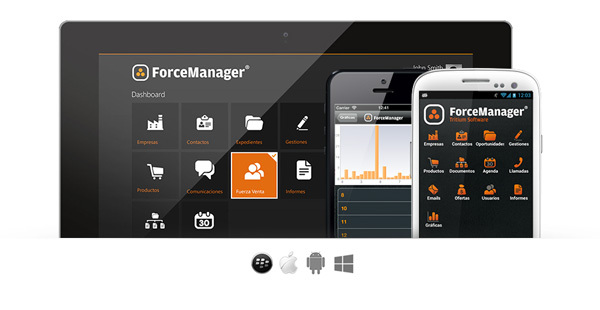 ForceManager has been developed from the ground up to be the optimum software for managing a mobile sales force equipped with the latest devices. ForceManager provides the sales agent with relevant information on clients geographically close to their current position; they can thus identify opportunities nearby for a sale or an appointment, and the best way to get there. This means more contacts in a shorter time ' and more sales opportunities. The benefits of a cloud-hosted, mobility-based design go much further than smart access to information. The rapid geo-localised visit report (check-in) compares the geographical position of the sales representative with that of the potential customer, and checks the accuracy of the report. A visit can only be reported from where the meeting actually takes place, ensuring a true snapshot of each contact, in every location. Our core concept? Mobility. This is what differentiates ForceManager from other solutions. Companies that sell through contact between remote sales staff and potential clients can have a user-friendly management tool perfectly adapted to their needs. Sales force management has long been based on setting revenue targets and corresponding bonuses for the sales agents. This model assumes that results are all that matter ' not how those results are achieved. Yet this information is vitally important. Which actions are more effective for selling each product? How much sales effort is spent on opening new accounts? How much on up-selling or cross-selling? How much time is dedicated to each type of potential customer? 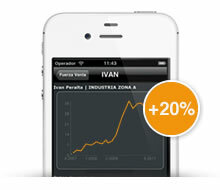 ForceManager is the first system to offer full transparency of sales force activity. Each impact generated by the sales force is automatically registered and linked to a geographical position, timestamp and target. This information can be combined with data about products offered and ordered, or income generated, to provide a detailed, real time overview of the activity and productivity of the sales team. ForceManager provides a wider picture of sales force behaviour, which allows for better informed management decisions and optimal sales performance.